Pityriasis amiantacea (PA) is a distinct inflammatory scaling reaction of the scalp that is characterized by the generation of firmly adherent, thick, waxy scales, which surround and attach to the hair bundles and take a silvery or yellowish coloration., The pathogenesis of PA remains almost completely unknown; its low frequency and diverse presentations have made PA a controversial disorder. Currently, evidence appears to indicate that PA is a prominent autoinflammatory response with possible participation of genetic and environmental factors., We describe an extraordinary case of PA on a patient with seborrheic dermatitis (SD) who manifested after the onset of valproic acid. 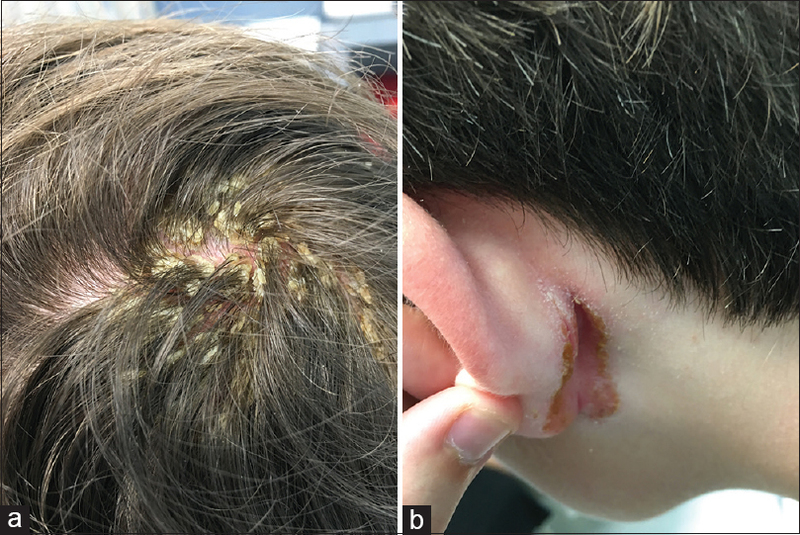 Our patient is a 16-year-old male with history of SD controlled by ketoconazole shampoo, who had episodes of impetigo caused by methicillin-sensitive Staphylococcus aureus effectively treated by cephalexin and mupirocin ointment. In addition, he had history of epilepsy. After starting valproic acid, he developed pruriginous, erythematous and yellowish scaly plaques on scalp, axillae, and pubic areas [Figure 1]. No pustules or erosions were identified. A biopsy was performed demonstrating psoriasiform hyperplasia, spongiosis involving epidermis and hair follicles, mounts of parakeratosis, serum crust, and follicular plugging. In the dermis was a superficial perivascular lymphohistiocytic infiltrate. In addition, deep and vellus hairs are observed in anagen and catagen, findings which are consistent with nonscarring alopecia. PAS stain is negative for fungal organisms [Figure 2]. A PA developing over SD was diagnosed, secondary to the possible effect of valproic acid. The patient was managed with a combination of clobetasol, salicylic acid, and ketoconazole shampoos. Furthermore, his antiepileptic therapy was switched to zonisamide. Two weeks later, a significant improvement of the patient presented with cutaneous lesions is documented. Other medications associated with the development of PA include the inhibitor of the mutated BRAF gene (vemurafenib) for melanoma. A careful understanding of these drug reactions could provide insights to prevent the development of PA lesions and also to allow an early diagnosis and management. However, one must keep in mind that cutaneous adverse effects can appear with variable time lapse. In our case, we observed that the disease was triggered after the use of valproic acid, a glycogen synthase kinase-3β (GSK-3β) inhibitor that stabilizes cytoplasmic β-catenin and facilitates the activation of the Wnt/β-catenin pathway., In our patient, valproic acid was started to manage a chronic epileptic disorder. Valproic acid GSK-3β inhibition promotes keratinocyte growth, especially in hair follicles, where its participation is critical for enhancing the proliferative activity of the dermal papilla and promoting the elongation of the hair shaft. This proliferative capacity has made valproic acid a candidate for the treatment of alopecia. Indirectly, valproic acid is also able to induce alkaline phosphatase similar to minoxidil. In addition, valproic acid also induces growth factors such as insulin-like growth factor-1, fibroblast growth factor-10, and the follicular stem cell markers keratin-15 and CD34., However, because of the rarity of PA, no cases of the association of PA with VA have been published. PA may occur at any age including children but is usually observed during teenage years. It is observed in both genders, with female predominance (60%–70%). Clinically, all cases present with dry, scaly lesions that may be circumscribed or diffuse, with associated pruritus, erythema, and nonscarring alopecia., Histopathology demonstrates extensive spongiosis, acanthosis, hyperkeratosis, parakeratosis, follicular keratosis, and mixed inflammatory cell infiltrate. Microorganisms' role in PA development has been debated. Staphylococci are isolated as colonizers in up to 97% of the PA patients, more commonly S. aureus, followed by coagulase-negative staphylococci and micrococci., In addition, diverse species of fungus, including Microsporum canis, Trichophyton violaceum, Trichophyton rubrum, Trichophyton schoenleinii More Details, and Trichophyton verrucosum, have been demonstrated in some reports. These microorganisms could be also implicated in the maintenance of the disease, producing epidermal cell differentiation inhibitors, leading to perpetuate the disease. Thus, the use of antibiotics plays a fundamental role in the treatment and/or prevention of PA recurrences. The most commonly used antibiotic is ketoconazole 2% shampoo and oral griseofulvin (10 mg/kg). These medications have been associated with removal of scales after 2–3 months of treatment. Abdel-Hamid IA, Agha SA, Moustafa YM, El-Labban AM. Pityriasis amiantacea: A clinical and etiopathologic study of 85 patients. Int J Dermatol 2003;42:260-4. Amorim GM, Fernandes NC. Pityriasis amiantacea: A study of seven cases. An Bras Dermatol 2016;91:694-6. Verardino GC, Azulay-Abulafia L, Macedo PM, Jeunon T. Pityriasis amiantacea: Clinical-dermatoscopic features and microscopy of hair tufts. An Bras Dermatol 2012;87:142-5. Hansted B, Lindskov R. Pityriasis amiantacea and psoriasis. A follow-up study. Dermatologica 1983;166:314-5. Udayashankar C, Nath AK, Anuradha P. Extensive Darier's disease with pityriasis amiantacea, alopecia and congenital facial nerve palsy. Dermatol Online J 2013;19:18574. Shiiya C, Nomura Y, Fujita Y, Nakayama C, Shimizu H. Psoriasis vulgaris with fibrokeratoma from pityriasis amiantacea. JAAD Case Rep 2017;3:243-5. Hussain W, Coulson IH, Salman WD. Pityriasis amiantacea as the sole manifestation of Darier's disease. Clin Exp Dermatol 2009;34:554-6. Ettler J, Wetter DA, Pittelkow MR. Pityriasis amiantacea: A distinctive presentation of psoriasis associated with tumour necrosis factor-α inhibitor therapy. Clin Exp Dermatol 2012;37:639-41. Ring DS, Kaplan DL. Pityriasis amiantacea: A report of 10 cases. Arch Dermatol 1993;129:913-4. Bilgiç Ö. Vemurafenib-induced pityriasis amiantacea: A case report. Cutan Ocul Toxicol 2016;35:329-31. Lee SH, Yoon J, Shin SH, Zahoor M, Kim HJ, Park PJ, et al. Valproic acid induces hair regeneration in murine model and activates alkaline phosphatase activity in human dermal papilla cells. PLoS One 2012;7:e34152. Wiltse J. Mode of action: Inhibition of histone deacetylase, altering WNT-dependent gene expression, and regulation of beta-catenin – developmental effects of valproic acid. Crit Rev Toxicol 2005;35:727-38. Jo SJ, Choi SJ, Yoon SY, Lee JY, Park WS, Park PJ, et al. Valproic acid promotes human hair growth in in vitro culture model. J Dermatol Sci 2013;72:16-24. Chou YC, Chao FH, Chou YH. Rapid development of severe skin rash after adding valproic acid in a case of bipolar depression treated with low-dose lamotrigine. J Formos Med Assoc 2014;113:195-6. Gupta LK, Khare AK, Masatkar V, Mittal A. Pityriasis amiantacea. Indian Dermatol Online J 2014;5:S63-4. Knight AG. Pityriasis amiantacea: A clinical and histopathological investigation. Clin Exp Dermatol 1977;2:137-43. Ginarte M, Pereiro M Jr., Fernández-Redondo V, Toribio J. Case reports. Pityriasis amiantacea as manifestation of tinea capitis due to microsporum canis. Mycoses 2000;43:93-6.